The Broadmoor Resort in Colorado Springs is known for impeccable service and distinctive amenities paired with plenty of personal luxuries, all in the timeless elegance of a historic hotel. It’s the longest-running consecutive winner of both the AAA Five-Diamond and Forbes Travel Guide Five-Star awards. If you want to experience the beauty and adventure of the American West, this is your perfect destination. The awards for excellence keep piling up here with the spa receiving 5 stars from Forbes Travel Guide, and the elegant Penrose Room restaurant that can boast its place as the only Five Star, Five Diamond restaurant in Colorado. The resort has 54 holes of championship golf over three courses including the famed mountain course, six tennis courts, indoor and outdoor pools, distinctive retail shops, a variety of dining options, cafes and lounges, bars and pubs, and activities for guests of all ages. For those looking for the inspiration of a wilderness enclave, the Broadmoor offers The Ranch at Emerald Valley, surrounded by 100,000-plus acres of the Pike National Forest – a private escape to 10 beautiful cabins with gas fireplaces, rich furnishings and the resort’s famous service. It’s the ideal base for those who want to fish in pristine mountain lakes, hike and bike scenic trails and explore the mountains on horseback. A dedicated ranch staff and on-site chef elevate this destination beyond its 8200 foot altitude. Unwind in an outdoor hot tub and sip fine wine on the terrace, but don’t worry about the details. Meals and ranch activities are included as part of your stay. Situated at 9200 feet atop Cheyenne Mountain, the newest wilderness experience offered by the resort is Cloud Camp, and getting there is half the fun! Guests have the option to ride – by luxury SUV or mule – or can make the 3 mile hike from Will Rogers Shrine of the Sun to the camp at the summit of the mountain. You’ll have spectacular views of Pikes Peak – America’s Mountain – from Cloud Camp’s 8000 square foot main lodge, a dozen one and two bedroom guest cabins, or the seven beautifully appointed rooms within the main lodge. Daytime and evening camp activities capture the spirit of this Colorado getaway, and you’ll dine on meals (inclusive in your stay) presented by award-winning Broadmoor chefs. This destination is both an ideal retreat and a fabulous choice for group adventures. 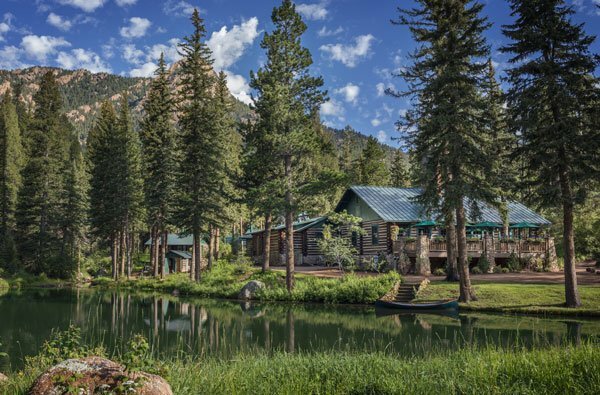 The Broadmoor’s Fishing Camp is located in the mountains a bit more than an hour west of the main resort on private waters of Colorado’s Tarryall River bordering 120,000 acres in the Lost Creek Wilderness. You’ll stay in well-appointed rustic cabins surrounding the main lodge, and enjoy activities including fly fishing with professional guides, horseback riding and hiking, and the opportunity to see some amazing wildlife. For more information, visit the Broadmoor website. previous articleLet’s See Those Mega truck Crashes!